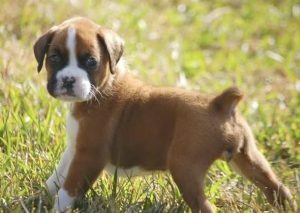 Hailing from Germany, the bulldog and German bullenbeisser are the boxer’s direct ancestors. 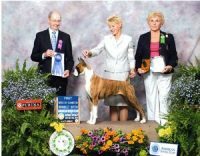 The first of its kind was registered in 1904 by the American Kennel Club. During World War I, they were actually used by the military as messengers and guard or attack dogs. In fact, this is where their American popularity came from; soldiers coming home from war brought their “war buddies” back to their families to care for. 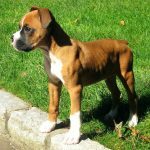 Part of the “Working Dogs” group (defined as dogs that can master certain functions in order to assist or entertain their owners), the boxer’s full size ranges somewhere between about 1′ 9″ and 2′, with their healthy weight lying somewhere between 60 to 70 pounds. Although they are short-haired dogs, they can shed quite a bit. However, with basic grooming and vigorous brushing once a week, their hair is very manageable. 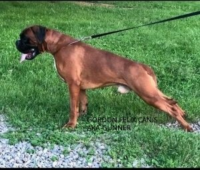 Their coloring is mostly fawn (mahogany to light tan) or brindle (black tiger stripes) with white markings, mostly on under their belly and feet. Those without any white markings are called plain boxers. Their faces generally have a black mask-like look and can often have a blaze or white stripe that goes up their nose to their eyes. 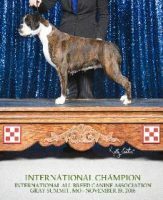 This breed is definitely a dog that goes along with the adage of, “don’t judge a book by its cover.” When compared to most other dogs, they can be considered large, but it’s their muscles that really tend to deter people from buying or even approaching this dog. But boy would you be wrong to mistake them for a dog that is liable to snap at you. They are one of the most good-natured and energetic dogs out there, constantly seeking out pleasure and fun. They are apt to buoyancy, jumping up and down, twisting, and even flipping. 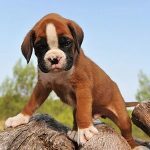 This might be due to their extra-long period of being a puppy; don’t expect them to be fully mature until they are at least three years old. And when they’re not being lively, expect an observant and protective dog, extremely loyal to their family. They may seem cautious around strangers, but will not pose a threat unless they believe danger is imminent to their family. They do not like to be alone, either. Socialization is very important to the pup; the amount and kind of interactions they have with humans and other dogs is a really important factor in determining their exact temperament as they grow older. Even though at the outset they sound very rambunctious, they can and really should be trained. But you’ll need to start as early as possible to get proper results. Because of their fun-loving and carefree personality, you’ll need to be both very firm in your training while also making it fun for them. They don’t always respond well to rigidness. Always remember how strong dogs of this breed are; they can hurt people by accident, so getting them trained properly is essential for a successful experience for both you and your pet. 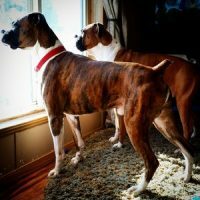 While they love the freedom to be able run and play outside openly, with the right amount of frequent exercise, they can work as an apartment dog. Make sure to walk and play with them twice a day for at least a half hour each time. They should not be left outside for long periods at any time as they aren’t accustomed to cooling themselves off in the summer and their short coat won’t keep them warm in the winter. They should be fed twice a day with high-quality food, 2-3 cups depending on the size and age of your dog. As long as their health-related needs and diet are maintained sufficiently, you can expect them to live up to 10-12 years. 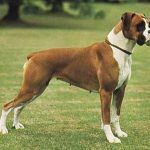 Some diseases that are commonly contracted among this breed are: aortic stenosis/sub-aortic stenosis (heart defects), hip dysplasia (arthritis in rear legs), cancer lymphoma, brain and mast cell tumors), corneal dystrophy (deterioration of cornea), boxer cardiomyopathy (arrhythmia), hypothyroidism, and gastric dilation-volvulus (excessive bloating that causes a drop in blood pressure, sometimes leading to shock). Additionally, deafness is also very common. It is always best to consult the dog’s family’s health history to determine how susceptible they are to any of these diseases. 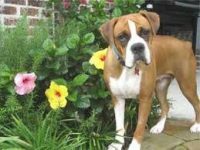 While being a great family dog, boxers are also popular dogs among the police force and military due to their loyalty and muscle mass. When trained adequately, they can make for exceptional guard dogs, taking down potential intruders.